Every business experiences staffing shortages from time to time, and finding qualified people to fill these positions can be a true challenge in today's market. Our goal at Dial-A-Temp is to provide you with associates who fit your business needs both temporary, temp to hire, and permanent placement. 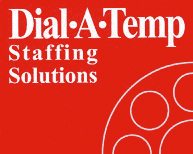 Dial-A-Temp can be your "life preserver" to keep you afloat with your staffing needs. Think of us as an economic component to your operation and a key solution to get you through the downturn economy. Dial-A-Temp knows that in order to be successful, you need to have the right people for the right jobs. That's why Dial-A-Temp is very thorough in our selection process. Candidates are carefully prescreened, reference checked, and interviews are completed. Perform criminal background checks and drug screening per the customers' request. Our staff tours all our clients' facilities, to insure the best candidate for the position. Our staff provides the best qualified people at the lowest prices and placed tomorrow!! We invest in our people, not real estate!